Lily: Much better suited for managing Annabelle the Sheep and Izzy the Goat than I. The barn was calm Saturday morning. It was overcast, but there was no chill in the air. The horses were slow to come in for breakfast, so I took my time. Stopping to scratch the soft spot behind Jenni the pig's ear. Snapping pictures of trees in bloom. Chatting with the hens who always seem to be fussing at me for unknown reasons. I enjoyed the cacophony of song birds rejoicing at the new season. OK, maybe that last part is a little generous. Really what those birds are doing is advertising their availability to certain female birds. And reveling in all the tail they're hoping to get. But this is a family blog. So it's much more pleasant thinking that they're just out there cheering on the hyacinth pushing through the dirt and reveling in the warm breezes. This pastoral jubilee along with the assuredness of having nine months as a part-time farmhand under my belt, allowed me to stop and really appreciate the simple life. What joy! What satisfaction! What happy industry marked my hours there! I even found myself waxing poetic about the worn metal notch on the water pump that allowed me to hang up my bucket instead of setting it on the dirty ground. How thoughtful of that resourceful person generations ago who thought to add this handy detail when forging the pump. I found myself thanking the unknown inventor of the water pump notch out loud – recognizing that seemingly small deeds can span decades, maybe centuries even, tethering us all in this web of human connection. Farmer Jim would've appreciated that. If you find yourself rolling your eyes a little right now, don't worry. My little detour to bucolic bliss town ends here. See, the water pump notch inventor inspired me to think ahead about the chores to be done. Rather than rush around to make up for things I forgot to do, I decided to be more deliberate. This started with opening all the stall doors – which would make it easier when it came time to let the horses in. Only Ally was ready for breakfast at this point, so I opened the paddock gate for her. She walked right into her stall. And because I'd already opened the door, I didn't have to race ahead of her to open it while she wandered over to the other horses' food buckets, nabbing breakfast wherever she could get it. 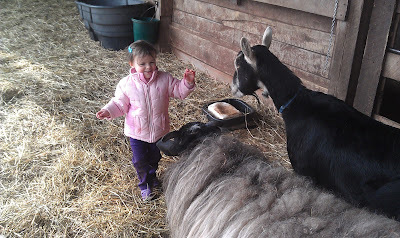 The other horses still weren't ready to come in, so I visited the sheep and goat enclosure. As usual, Lola and Izzy were bleating at me. The sheep were in the back staring expectantly. I refilled their water bucket and got breakfast for Fiona the goat, who is older and skinny and in need of a little extra TLC. I couldn't feed Fiona in the enclosure though. Why? 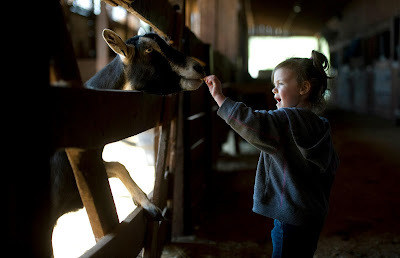 Because the sheep and goats always act as if they don't spend their entire day grazing on lush grass and clover and the crackers farm visitors share with them. Whenever there's the slightest whiff of food activity they attack the bowls with a fury and militancy I've only seen exhibited in my children when given access to a bowl of ice cream. Had I brought the food to Fiona, there's no chance she would've gotten to eat any of it. So I had to get her out. I was stunned when she rose calmly and followed with only a gentle prodding of her collar. I was even more stunned when the others stayed back, allowing Fiona to exit without a lot of hullabaloo. I was just about to close the gate behind us when the hullabaloo struck. Annabelle, the willful karakul sheep rushed the gate, squeezing past me despite my best attempts to block it. I pushed it closed against a growing tide of wily livestock. The sheep raced to the feed room and was attempting to root out any delicious morsels she could find. Meanwhile, meek, mild-mannered Fiona was in a horse stall (you know, because I'd had the brilliant forethought to leave them open), helping herself to a bucket of horse feed. I grabbed a bowl of grain and lured Annabelle back to her enclosure. Lola and Izzy were climbing the gate. I opened the latch, pushing them back. Shaking the bowl of grain in one hand I tried to get Annabelle back into the enclosure while holding the rest at bay with my other arm. I was like Chris Pratt with the raptors in Jurassic World. Minus the Jedi mind tricks. And the ability to maintain control. The gate had to be wide enough for Annabelle to feel comfortable to get through, but not wide enough to allow the others to escape. Annabelle came in lunging at the bowl of food. Izzy and Rosie the sheep got out. I guess the gate was too wide. Now Izzy was snacking on horse feed. Rosie wandered nervously up the barn aisle. Unsure of what to do with her newfound freedom. I got Rosie back into the enclosure easily enough. Let's be honest, she wasn't sure she wanted to be out to begin with. As usual, Izzy was a bit more of a challenge. I grabbed a half-eaten bucket of horse food (no thank you Fiona) and enticed Izzy into the horse paddock (she squeeze under the fence to get in there anyway). I closed the gate using the metal bar, but not the latch. This is important to note. I got Fiona out of Tessa's stall and gave her breakfast in the barn aisle. The rest of the horses started coming in. I'd just put Sonny in his stall when I heard the metal bar thud. It was the thud of idiocy on my part. Because there's a reason for the additional latch on that gate. That reason is goats. Specifically goats, who let themselves out of the paddock by nosing back the metal bar, which allows the gate to swing open, given said goat access to whatever feed and hay they want (which is all of the feed and hay). Izzy was out again. This time eating Fiona's breakfast. Another bowl of feed. More food shaking and pleading with the goats to go home. Another onslaught of sheep and goats, punctuated by being horned in my posterior by Annabelle. I escaped. Closed the gate. Latched it. Stopped to take a deep breath. Wipe the sweat from my brow. The horses were stomping and whinnying at me. Asking what was taking me so long. Back when I was admiring the simple ingenuity of the notch on the water pump, I wanted the lesson of the day to be about the benefits of being purpose driven. Of identifying a thing to be fixed or improved and improving or fixing that thing. Of being thoughtful and deliberate. There's a quote Brad likes to share with me periodically when I'm bemoaning his constant list-making. I tried it his way at the barn on Saturday. And I'm pretty sure I still failed. Which leads us to that other quote, "The best-laid plans of mice and men oft go astray." "When goats are afoot, plan for the apocalypse (or, at least a minor headache)." For the record, I still love goats. Which is maybe the real lesson in all of those: Sometimes the things you love, are also the things that drive you crazy.